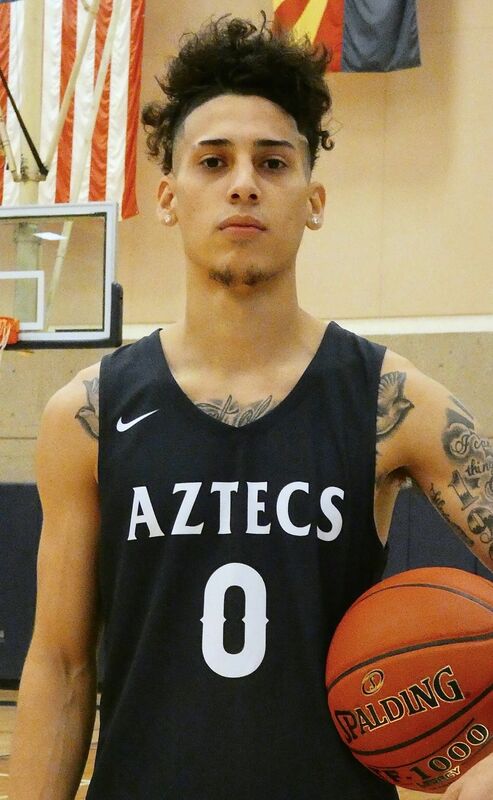 Pima’s Bram Carrasco (0) is on pace to become the Pima Aztecs’ leading career scorer in the 50-year history of the program. Bram Carrasco was the Arizona Daily Star 2015 Player of the Year with Cholla High School. After taking two years off, he is in his second season with Pima, and he just might be named ACCAC Player of the Year in a few weeks. Admission to a Pima College men’s basketball game costs a mere $5, or $3 if you are a certain age. There isn’t a bad seat in the house. There are no extended TV timeouts, no stoppages for the referees to study a replay, and, get this, the Aztecs average 98 points per game. A year ago, Pima College averaged 102 points and finished second in nation. This year, the Aztecs could win it all. You have just two more opportunities — Feb. 20 and 23 — to watch this entertainment spectacle, which has no peer in Tucson sports. But it’s more than that. It’s that you have just two more opportunities to watch PCC point guard Bram Carrasco at the PCC gym. In a city renowned for its point guards, Jorge Abraham “Bram” Carrasco, Cholla High School Class of 2015, has become must-see basketball. A few weeks from now, barring injury or illness, Carrasco will become Pima College’s all-time scoring leader. That covers about 50 years of PCC basketball. But the bigger story is that Carrasco averaged only 17 minutes a game last year, and about 25 minutes this season. Yet he averages 20.8 points per game, and neither Carrasco nor his coach, Brian Peabody, consider this unusual. “If ever there was a system invented for Bram, this is it,” says Peabody, whose team is ranked No. 10 in the NJCAA Division II poll, 20-5 overall. Peabody’s style is fast and faster. A year ago, when PCC went 31-5, it played so fast that Carrasco averaged 18 points while playing just 17 minutes a game and rarely starting. Carrasco starts this year and has bumped up his minutes-played total to about 25 per game, although it must be told that in close games, he rarely comes off the court. Not everybody can do this. Pima doesn’t stop for gas. It doesn’t stop until the clock hits 0:00. The emergence of Carrasco as a star-level JC player isn’t a shock. He was the Star’s 2015 Player of the Year, leading Cholla High School to a 25-2 record. But this isn’t a free-flowing story of instant success with no bumps along the way. When Carrasco began attending PCC workouts, Peabody informed him he would be in a job-share situation, splitting time at the point. That’s PCC’s style. The pace is so fast you ideally can’t have just one point guard or one power forward or one anything. Carrasco reacted the way most 19-year-olds would. He didn’t like it. He had always been The Man at Cholla, scoring 1,210 career points and averaging 22.7 points per game as a senior. So he left campus, intending to play at nearby Tohono O’odham Community College. Instead, he sat out the 2015-16 and 2016-17 seasons. This turned out to be a blessing for both Carrasco, now 21, and Pima. Carrasco matured, got his life in order and started the clock on his college basketball eligibility just as Peabody’s program became a national championship contender. Carrasco is maybe 5 feet 10 inches tall, but his motor makes up for what he lacks in dimensions. So far he has received scholarship offers from 10 Division II colleges, but Peabody believes that once the Aztecs get to the ACCAC and region playoffs, the Division I schools will discover Carrasco. What’s most impressive is that Carrasco is shooting 50.5 percent overall and 47 percent from 3-point range in ACCAC games. Almost nobody except a Steve Kerr or Salim Stoudamire does that. And it’s not that he just takes the safe shots. In a recent game he missed five consecutive shots — and then made the next six. At Cholla and before that at Safford Middle School, Carrasco was always the fastest kid in class and on the court. Once he learned to handle a basketball and develop confidence in his shot from any distance, he became a defensive player’s nightmare. The Aztecs are anything but a one-man team. Kennedy Koehler averages 18 points per game, Robert Wilson 14, Rashad Smith 12 and Davonte Eason 10. Jordan Robinson and Cole Gerken have been strong contributors. But it all spins on Bram and his never-stop motor. “I blow by anybody,” he says with the type of confidence that makes him a top candidate to be the ACCAC Player of the Year.